It has become a norm with startups in India, isn’t it? Get Funded, Grow aggressively and once you have gained some traction and created your own network in the market, spread horizontally. Ola is doing it, Zomato is doing it and every other well funded startup is doing it in one way or the other. Oyo Rooms, now a leading a player in branded budget accommodation segment is also walking the same path and spreading its wings. They are set to launch new Food Tech venture as well as Housekeeping service as per an ET report. Oyo’s food tech venture called Oyo Café will aggregate kitchens from it’s own listed hotels and will sell food under its own brand name. Oyo has been expanding aggressively since it landed $100 million funding in July of this year. They currently have over 30,000 rooms in 3000 properties across 130 Indian cities under their umbrella. Interestingly, Oyo Café wants to be just a food supplier and want to partner with other food tech platforms like Zomato or Swiggy to distribute the food for them. So, every hotel in their network that has a kitchen will be a supplier of food, which third party food delivery platforms can list on their platform and sell it to their consumers. In our view, while this may look as logical extension, it still moves away their core focus of providing Budget rooms to customers. Along with Oyo Café, the company is also planning to launch on-demand housekeeping and cleaning service called Oyo Care. In this case, the Oyo’s existing area managers in various cities can double-up and start offering housekeeping services to rooms on demand with help of their team. No further details are forthcoming on this as of now. 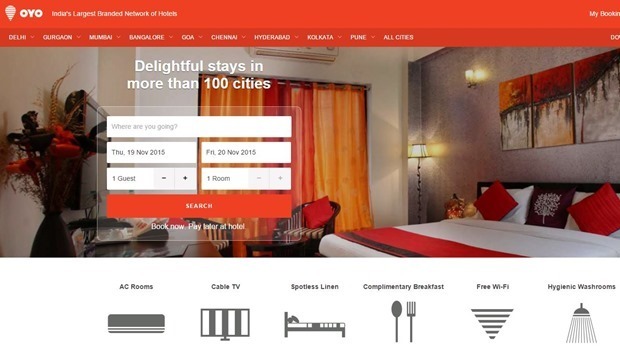 Oyo Rooms, although a leading player in Budget rooms aggregation space is currently burning cash as they guarantee minimum revenue to hotels for inventory allocated to them. On the other hand they are also incentivizing their customers, which adds heavily to their cash burn. Launch of these additional services are the expected to make up of some of cash burn happening in their core business. Oyo is entering into segments which are already choc-o-block with competitors. Food-tech & Housekeeping startups have mushroomed in nearly every city in India, many of which have also got good funding. Oyo is a late entrant in this space, and only time will tell if they can garner good market share in this space! "Oyo Rooms Set to Launch Oyo Café & Oyo Care Housekeeping Service", 5 out of 5 based on 3 ratings.